When Olympian and international XXC racer Jeremiah Bishop sets a course record, it's fairly safe to use that as a baseline, and rule that time as unbreakable. When I lined up for my last race of 2017, the Creature from Carvins Cove XXC, I knew it was going to be long day. Bishops record was right around the 4:02 mark for 42 miles and 6,000' of climbing. It's been a long year. I renovated my house all winter, spring and into the summer and finished in August, started a Salesforce consulting firm Cornerstone Insights, and we had our first kid. Racing and training were not optimal, more of a "do my best" kind of deal. But this was Carvins Cove, my home trails, and I wanted to have one good performance to round out a year of podiums but no wins. With less than stellar fitness and Bishops time in mind, I toed the line, not even really checking who was there. I've never raced home trails before, so I was going to do this right and give myself every chance for success despite my lackluster season. I started with homework. I can't recommend this enough. If you want to do well on a course, do everything you can to know the course. Maybe that's pre-riding, maybe that's studying past years strava files to see climbing speeds, tempo changes, and where racers rested and took feeds. Talk to people who know the conditions to get tire selection and pressure dialed. And of course, plan how you are going to take your nutrition. The week of the race I went out to Carvins and rode a few sections that I knew would be fast and dusty from the lack of summer rain. I wanted to know how the tires I had picked would do in the dust at race pace in these particular spots, so that when I was railing and taking risks I would be confident. I settled on Bontrager XR2 tires front and rear. I usually run an XR3 in the front at Carvins, but without moisture on course, I went for the lighter, faster tire. The gun went off and we started our 3 mile assault on the fire road out to the first single track. Jeff Glenn, local fast man, tore through the fire road and set a furious pace. About a mile before the singletrack, Acie Hylton, a very strong climber riding for KTM, got on the front and strung things out. I took the inside line on a few corners and grabbed the holeshot onto Schoolhouse. With a train of 6 guys, I wanted to see how everyone was driving after the effort and I opened the throttle a bit. Knowing the course, I could do this without working too hard with lots of brakeless turns. We snapped the cord a bit and 4 of us rolled away: Wake Fulp, Acie Hylton and Robbie Bruce. Onto Little Bell we flew, and by the time we hit Enchanted Forest we were averaging 13.8mph. We were sliding through the dust leaving a big cloud in our wake (which made being on the front very nice!). We hit a fire road before Tuck A Way and I let Acie take the front and set some pace. At the 4 way with Comet, Acie took a right following the XC arrows so we shouted him back on course and he lost about 10 seconds. It was bummer timing as this was my first test point that I had preplanned. We had about a 12 minute climb starting there with Tuck A Way that is a bit technical, and I floored it. With Acie a few bike lengths back, Robbie Bruce stuck on my wheel. I wasn't super thrilled with that midway up the climb so I gassed it again and finally opened a few seconds. Onto a steep fireroad section next, I dug in and pushed the gap open. I knew the steep and fast downhill coming up and wanted to put more time there without showing any lines to Robbie. I only found out after the race that Robbie used to be a local to Roanoke and also knew the trails. Meanwhile, Acie was not, and he was tracking us about 1 minute back. Onto the Horsepens fire road and I sat up to wait and work with Robbie. He caught on and we drilled it up to Trough at his urgings that Acie was right behind us. We hit Trough pretty hard but chatted a bit. Robbie asked my name, and I told him after the race this was his biggest mistake. When I told him my name and he promptly said "Oh I've heard your name before, you're way faster than me." Now, to this point, I was impressed with his riding and wasn't sure I was going to be able to beat him. But then he gave me that, and I knew that mentally, he assumed he couldn't beat me. So I started plotting my next attack, assuming that if I got out of sight, he would give up on catching me because he didn't think he could, not knowing I wasn't exactly at peak fitness. We crested Trough and he sat up to eat and I attacked while his hand was in his jersey grabbing a gel. Its a low shot to take at someone but we laughed about the whole mental game after the race, because ultimately, Robbie was the strongest rider of the day. I flew down the fireroad to Buck, and noticed Robbie hadn't been descending quite as fast as I had, so I thought I might be able to get some time on Buck before the climb up Hi Dee Ho. By the time I got to the climb, Jeff Brown was there cheering and gave me a bottle of Infinit which was crucial, and allowed me to keep rolling. Robbie was about 15 seconds back, which was disappointing as I was hoping for more, but it was all the motivation I needed. It was time to DRILL IT. Hi Dee Ho is tricky. It starts steep, then backs off to smooth dirt with technical and tight switchbacks. It doesn't allow for a very steady effort. I threw everything I had at it, which was so much less than I was hoping to have at that point which was 18 miles and 1:45 into the race. I cobbled together a 300w average and that got me up in 14:36, albeit minutes behind what I was hoping for. It was enough to have opened the gap to 45 seconds over Robbie which secured the foundation for phase 2 of the attack: Gauntlet. Robbie stopped at the top of the climb for a feed, ceding a little more time and I got to work on the longest downhill of the day. Ripping down Gauntlet is kind of like a dance. Steep chutes, tight turns, loose dirt, big roots, a few rock drops and its everything you could want in a downhill. But at race fatigue levels, its brutal. Another 44 seconds taken there and I was out of sight from Robbie. Now I knew a few things: Robbie might give up chasing, and I knew where I was better. 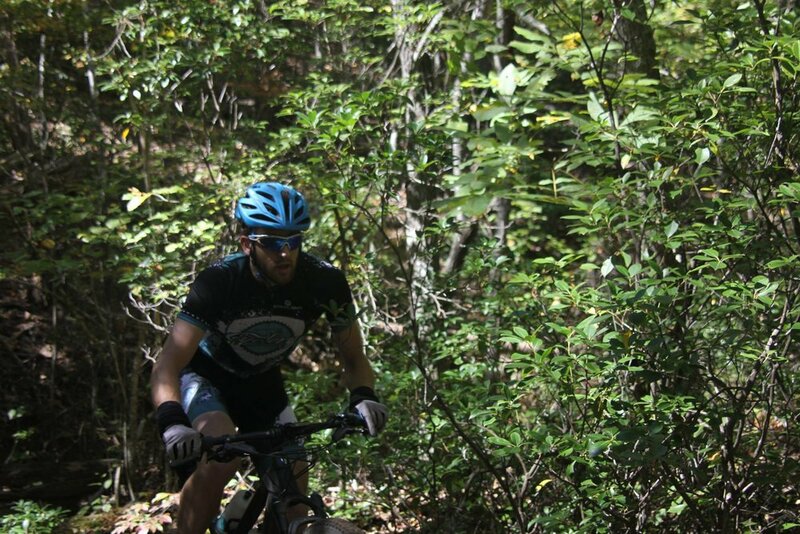 I was off the front of the race with only rolling single track left, 20 miles of it. I played it safe. I kept the gas on but I didn't take risks. One puncture or a good crash could wipe out my lead so that was out of the question. I flowed my way towards Rattling Run and started dialing back my efforts in anticipation of that trail. Rattling Run is the crux of the race. Up until that point, everything is ridable. But Rattling Run, even for the best technical riders, is not cleanable during a race. There's tons of super tricky rock features thats consequences outweigh the benefits of trying to ride. You're hopping off and on your bike constantly which taxes your muscles and encourages cramping. And cramp I did. The twinges started to come on, signs that cramping was soon to follow. I slammed down as much Infinit as I could, and eased my approach speed, opting to ride calmly and smoothly to reduce my risk of fumbling in the rocks. And Robbie was back in. He saw me on a switchback and began hunting again as my pace slowed. I managed a smooth go at Rattling Run and stretched the lead again, but it was close, about a minute. Onto the last singletrack Arrowhead and I was feeling the day lay heavy. I rode smoothly but the power wasn't there anymore. I was spent. I rolled through the rock features and popped out on the fireroad. 4 miles of fireroad was all I had left to win this race I had thought about for a year. I started to get excited. This was it. I couldn't see Robbie. I was in the clear. I pushed a decent gear but my exhausted legs groaned. 350w felt monumental on the rollers now. I was catching riders from the XC race and felt like I was moving quickly, averaging around 14.5mph. But it wasn't fast enough. With a mile left, I checked over my shoulder one more time, and there was Robbie, head down, closing FAST. I can't explain that feeling, but its terrible. You've been killing yourself for 4 hours and suddenly it's all in jeopardy. He was about 5 seconds behind me and had snuck up quick. Needless to say, I got ON IT. My heart rate skyrocketed as I stood up and started pushing 4-500w up the climbs. The surge was working and the gap held. The final climb to the line came and I sprinted with everything I had left to 800w and crossed the line first, 3 seconds ahead of Robbie. What a battle. As it turns out, he had been running from Acie Hylton who rolled in another minute later putting all of us 7-8 mintutes behind Bishops record which we were plenty happy with. A win on home trails with an exciting race, and excellent conditions was more than I could have asked for. The venue is perfect, the course was marked well and the execution was smooth by the director. I can't wait to get back to cool October racing at Carvins Cove next year!